Dude! It’s been, like, a year! I know, I know. In the past year I’ve moved house twice; set up a new website, a new blog and a new wiki; along with a whole bunch of other stuff. All that you need to know, however, is that I’ve made progress with Naze Besto. Well, I’m only upto page 14 – paragraph 2 to be specific. And while that doesn’t sound like a lot, it really is. This entire project is taking place in my spare time (when I get spare time, that is), and relies on a high level of concentration and skill – it’s been such a long time since I’ve had anyone to converse with in Japanese. That, and I’m only, really, able to work on this on Saturdays. Mainly because that when I meander into town with my copy of the book, my notepads (plural) and my phone. I’ll usually head over to StarbucksMulti-National-CoffeeShop™, park myself at a specific table and copy out a page or two of text. Although, I do head to the local University’s library every few weeks instead – mainly just to have a change of scene… that and I don’t want the baristas at the coffee shop to think that I’m taking advantage. 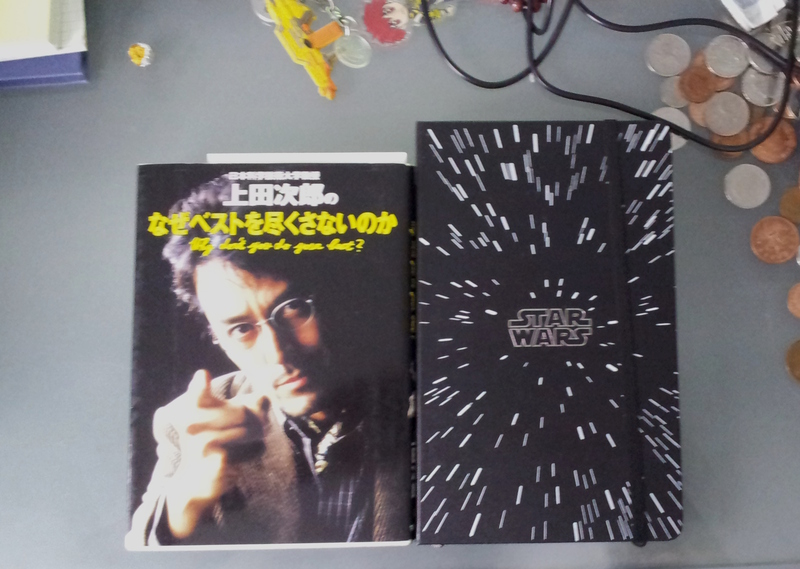 I’ve got one Genkō yōshi [link to wikipedia] notepad, and one that is a Star Wars Moleskine [link to entry on Moleskine website]. I’ve always loved Moleskine notebooks (maybe if I say that enough, I can get a free one 🙂 ). 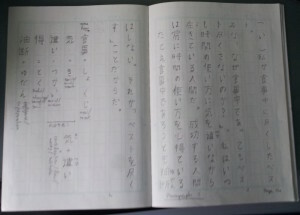 I use the Genkō yōshi notebook for copying sections out of the book – to practise my writing, and to make notes on new kanji. 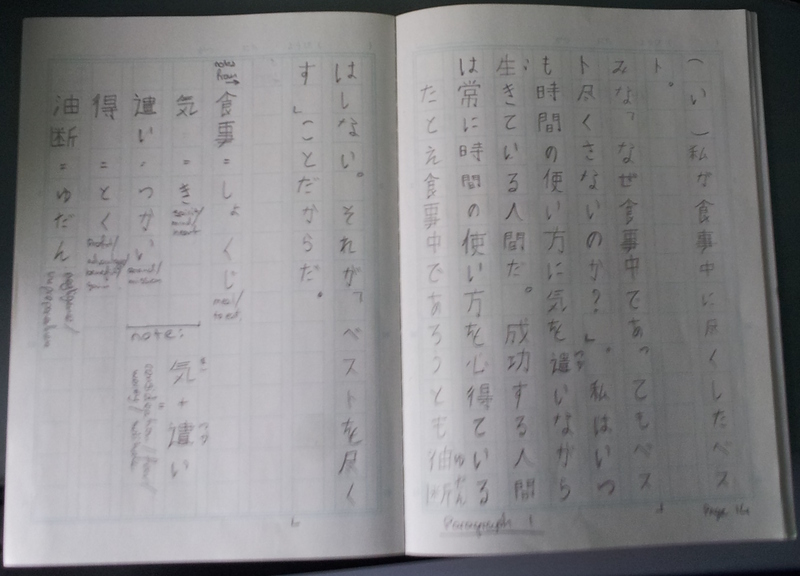 The Moleskine notebook is contains my attempts are translating whole sentences, ad hoc. I also use a couple of apps on my phone to help me look up kanji that are new to me. I use Kanji Recogniser [link to Kanji Recogniser site] to search for kanji that I have no idea how to read, and Aedict [link to Aedict of Google code] to look up grammatical constructs that I’m a little fuzzy on. Funnily enough, they both use the same dictionary files to do their searches. Both are Android apps, but I’m sure that there will be alternatives for iOS and Windows Mobile. Well, when I get home, I’ll type up my notes using JWPce [link to JWPce]. I’ll save them locally (on my computer), then upload them to my repository on GitHub [link to GitHub repo]. Once I have enough of the book in note form (usually a paragraph or so), I’ll include the translation to my LaTeX [link to wikipedia] file for that chapter and upload that to the same GitHub repository. Once all of that is done, I re-compile my LaTeX document to PDF, upload it to my webspace. After that, I edit the project entry on my wiki [link to the wiki for NazeBesto] to point to the latest build of the PDF. By the way, you can grab the latest build (which is kinda sparse, as I’m re-working the formatting at the minute) from this link: [link to the latest build]. That, ladies and gentlemen, is how I am going about translating「なぜベストを尽くさないのか？」(“Why don’t you do your best?”) into English.